John Wesley Wolfe, a Civil War veteran, left his family in Ohio to find relief from his wounds in a drier climate. He and his oldest son established a cattle ranch and trading stop for Indians. In their last years on the ranch, John’s daughter Flora and her family kept him company and contributed to the ranch. John Wesley Wolfe was born on February 17, 1829 in Tennessee. When the Civil War broke out in 1861, John joined the Union even though his home state joined the Confederacy. He fought in several major battles as a member of the 17th Ohio Battery. At the Siege of Vicksburg, John injured his leg lifting a cannon out of the mire and was given a disability discharge. He never walked without the aid of a crutch again, and this injury eventually prompted him to move to Utah. In 1898, at the age of sixty-nine, John decided to heed his doctor’s advice and move to a drier climate. He hoped the desert air would alleviate the pain in his leg and stop the infection from spreading. He only managed to convince his son Fred to go with him to southern Utah. John’s wife and their three other children stayed behind in Ohio. John and Fred erected a simple cabin and set to work creating their “Bar DX” ranch. Though it’s not visible today, there was abundant native grass in the area that allowed over 1,000 cattle to graze on the Wolfe’s ranch. In 1906, John’s daughter Flora and her family came to live on the ranch. She, her husband Ed Stanley, and their children Esther and Ferol brought new life to the remote homestead. Fred and Ed built a new cabin with wood floors and a window to make Flora and the children more comfortable. The men hauled timber from the Colorado River to use for the walls. They built the roof out of a frame of small logs and a large center beam. Fred and Ed laid bark from juniper trees and dirt from the surrounding hills over the top of the frame. The children helped stuff clay into the cracks between logs for insulation. 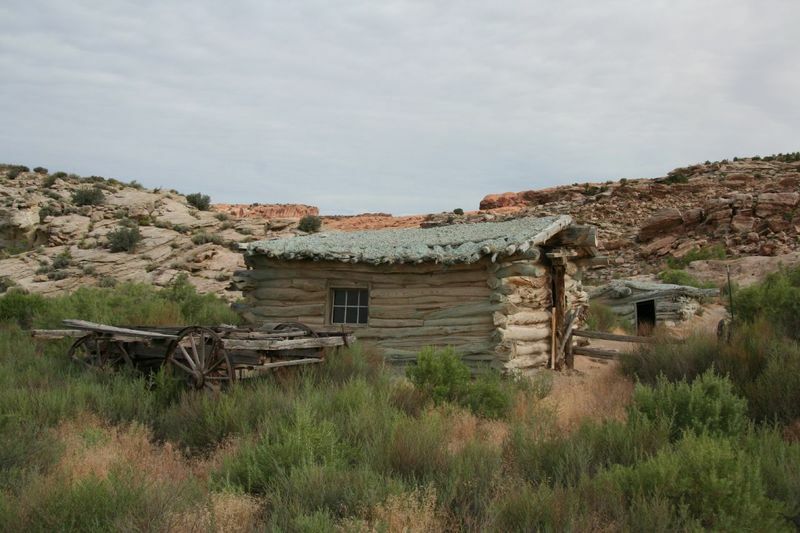 This cabin is visible from the trail that leads to Delicate Arch in Arches National Park today. Despite living in such a remote area, the Wolfes and Stanleys ate well. John irrigated a garden by plugging the creek that ran nearby with a simple dirt dam. He grew squash, corn, pumpkins, and a few extra melons to trade with the Indians who passed through. Few things made John as angry as when a rainstorm flushed out the dam. The family ate rabbit, venison, and chicken until butchering season came each fall and they had fresh beef. John supplanted their diet with groceries like canned milk that he picked up at Thompson Springs. Ed missed fresh milk so much that he once tried to milk a wild cow. The rest of the family watched as the cow kicked both hind feet and Ed quickly learned to be content with canned milk. After two years, the Stanleys moved to Moab so their children could receive a formal education. In 1910, John sold the ranch to Tommy Larson and moved back to Ohio. John died in October of 1913 at age eighty-four. In 1914, Marvin Turnbow, the first custodian of Arches National Monument, bought the ranch from Larson. 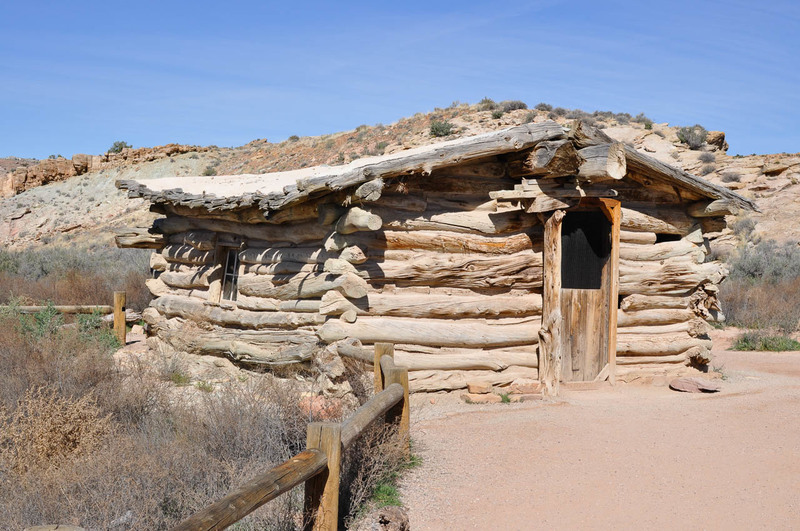 His family used the cabin occasionally until they sold it to Emmit Elizondo, who eventually sold the property to the U.S. government for inclusion in Arches National Monument. Arches National Park: Cabin of Wolfe Ranch, built in 1906 as a wood-floored replacement for John Wesley Wolfe's earlier cabin. The Wolfe’s grazed over 1,000 cattle on the surrounding land at the beginning of the twentieth century. ~ Source: Yaxbalam, from Flickr Creative Commons. “Arches National Park,” available at https://www.flickr.com/photos/yaxbalam/695943825/in/photolist-6ASPLe-euGpjC-euGj8u-euDe4X-QtDKfu-bWPY16-6ASPy2-csetCd-sdyf92-7PQ5CE-c2uSYm-6ktAkt-24uTRt-7zLWy8-wA3X1Z-u79qhY-vEfyYm-tJMrYA-wrxBa1-suCYpG-s6G4Xw-xvXjWw-wjuLP3-u73tcs-s5VWxg-wYYeVy-tbUhmd-saprTf-soU6fh-Q2isVT-5A6QpL-ow7npQ-9ihqzS-nbSKah-nbSK5C-nbSK7G-b4qvMz-s6Fw3Y-xmgd6S-seBzuy-sUfcJp-rvbs6g-sjtxho-ss1a8F-tS6tcD-UEok7F-TCt7zP-ouLy92-Uh3Yaj-2Unae3/. 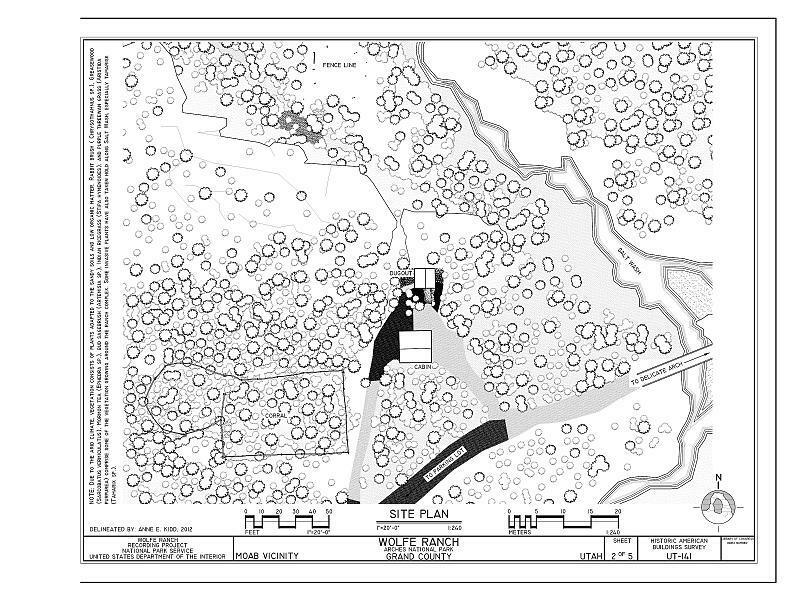 Site Plan - Wolfe Ranch, Moab, Grand County, UT: The Wolfe cabin is located at the beginning of the trail that leads to Delicate Arch. ~ Source: Kidd, Anne E, from Wikimedia Commons. “Site Plan - Wolfe Ranch, Moab, Grand County, UT,” available at https://commons.wikimedia.org/wiki/File:Site_Plan_-_Wolfe_Ranch,_Moab,_Grand_County,_UT_HABS_UT-141_(sheet_2_of_5).tif. Arches National Park, Utah: The window and hardwood floors in the second cabin were a luxury for the Wolfes and Stanleys. ~ Source: Reiter, Fred, from Flickr Creative Commons. “Arches National Park, Utah,” available at https://www.flickr.com/photos/tawarig/17207365065/in/photolist-6ASPLe-euGpjC-euGj8u-euDe4X-QtDKfu-bWPY16-6ASPy2-csetCd-sdyf92-7PQ5CE-c2uSYm-6ktAkt-24uTRt-7zLWy8-wA3X1Z-u79qhY-vEfyYm-tJMrYA-wrxBa1-suCYpG-s6G4Xw-xvXjWw-wjuLP3-u73tcs-s5VWxg-wYYeVy-tbUhmd-saprTf-soU6fh-Q2isVT-5A6QpL-ow7npQ-9ihqzS-nbSKah-nbSK5C-nbSK7G-b4qvMz-s6Fw3Y-xmgd6S-seBzuy-sUfcJp-rvbs6g-sjtxho-ss1a8F-tS6tcD-UEok7F-TCt7zP-ouLy92-Uh3Yaj-2Unae3/. Samuel Hauber, Brigham Young University, “The Wolfe Homestead,” Intermountain Histories, accessed April 19, 2019, https://www.intermountainhistories.org/items/show/200. From the National Park Service. “Arches National Park Utah: Wolfe Ranch,” available at https://www.nps.gov/arch/learn/historyculture/wolfe-ranch.htm. Newell, Maxine. A story of life at Wolfe Ranch (Moab, UT: Canyonlands Natural History Association, 1980). Roach, James L. “Turnbow Cabin,” The Elementary School Journal (October, 1970).